Meat quality grade is key in a Wagyu beef operation and should be considered fundamental for all Wagyu breeders. Over the last decade carcass grading has become an essential element for Lone Mountain Wagyu, our beef division – and meaningful for our cattle breeding operation as well. Our most sophisticated beef customers (restaurants and home consumers alike) trust our brand because of the objective, transparent grading system. And of course, the rigor and precision of the carcass grading tools outlined below give us invaluable guidance as to future breeding decisions. Initially, the camera and software were developed as research tools. But under the direction of Professor Keigo Kuchida, Obihiro University in Hokkaido, Japan, the camera and software have evolved to make the technology commercially viable. The camera/software tool is rapidly becoming a fixture in slaughter facilities in Japan and attracting interest from countries elsewhere. In 2010 Lone Mountain acquired the technology (camera and software) from Japan. 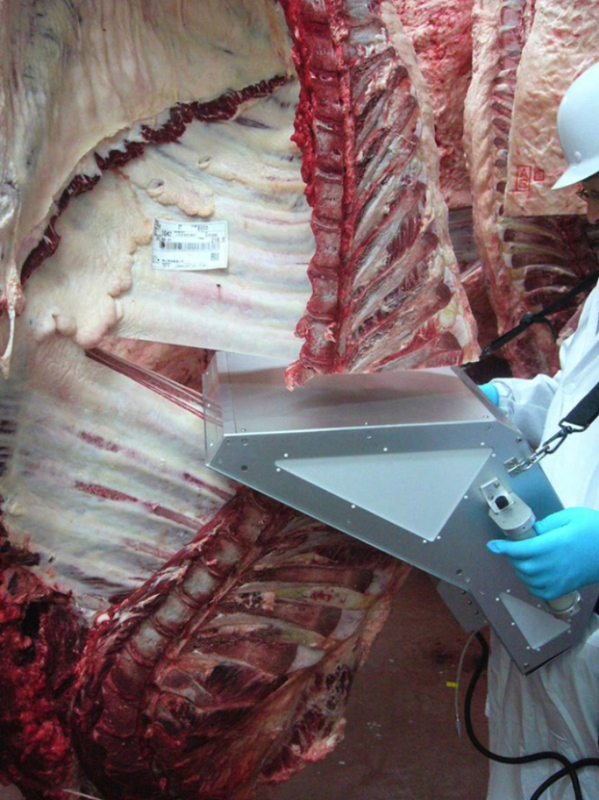 Now Lone Mountain carcasses are measured with the same matrix as the carcass quality grade information that is used and referenced by the Japan Meat Grading Association (JMGA). 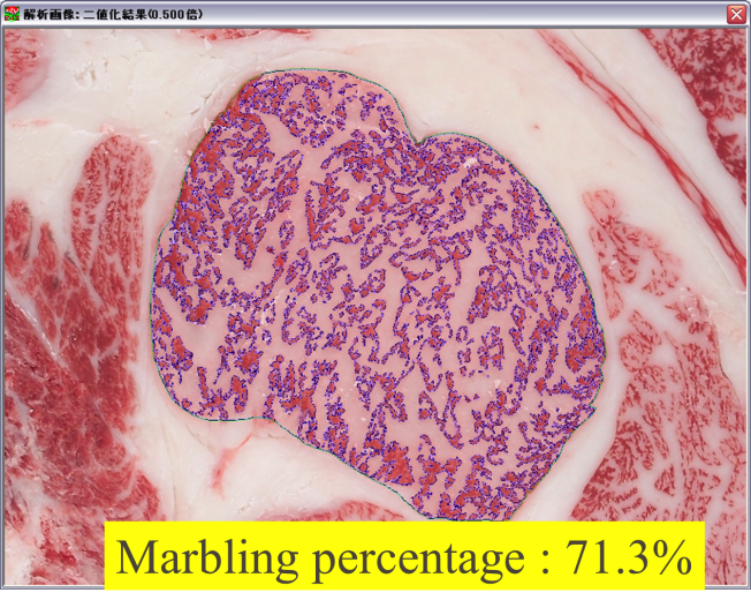 The camera identifies traits that hold economic importance, such as the quality of marbling, which can significantly influence the value of the carcass in Japan at the auction markets. 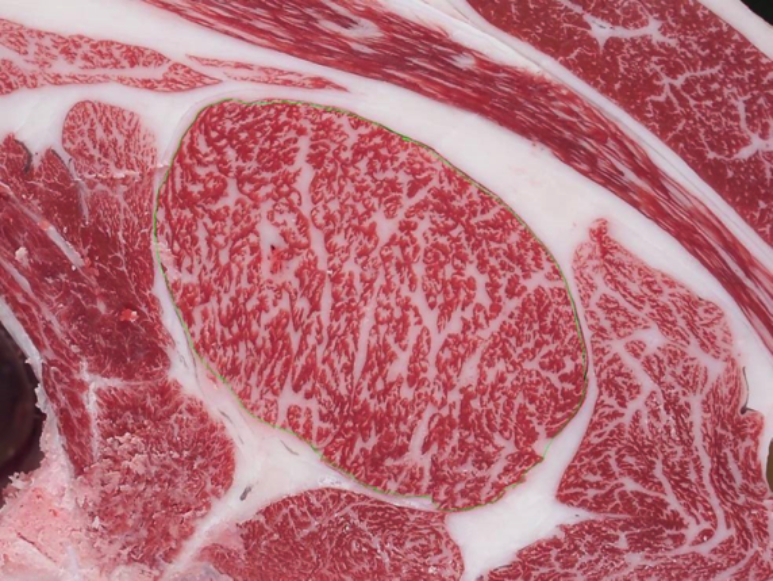 For example, fineness of marbling is a particular trait that is prized over coarser marbling; pictured below are two images displaying coarse and finely marbled ribeyes, respectively. The focus of this particular trait has been of interest to the Japanese in the past, and now is increasingly being identified as an important characteristic to countries producing Wagyu outside Japan. The combination of particular carcass quality traits analyzed by the carcass camera results algorithmically in an overall Beef Marbling Score (BMS). The evolution of that BMS marbling standard has been cause for some confusion. 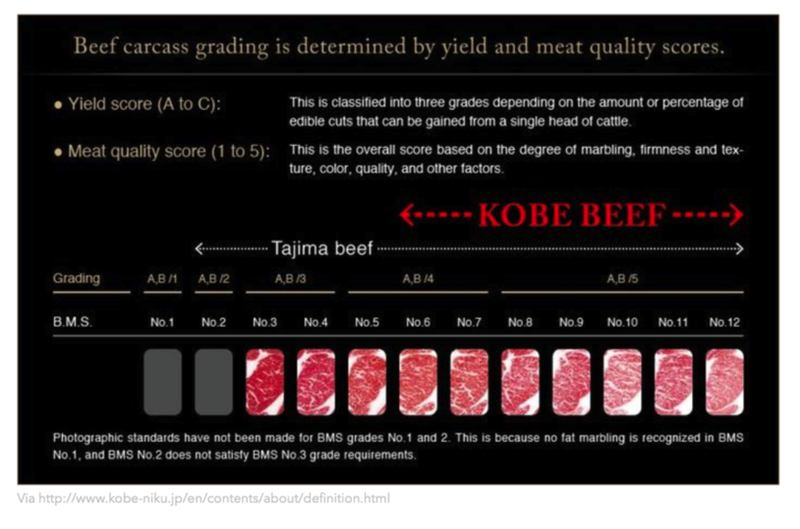 The JMGA Beef Carcass Grading Standard (BMS) was developed in 1988 to evaluate beef carcasses. The levels of marbling for BMS were based on plastic models – rudimentary at best given recent developments. In 2008, photographs were utilized and replaced the 1998 standard. In 2014 Japan raised the bar again. Currently a BMS 3 grade requires a minimum of 21% IMF. The images used to establish the new standard were selected using a combination of IMF% and a fineness index. 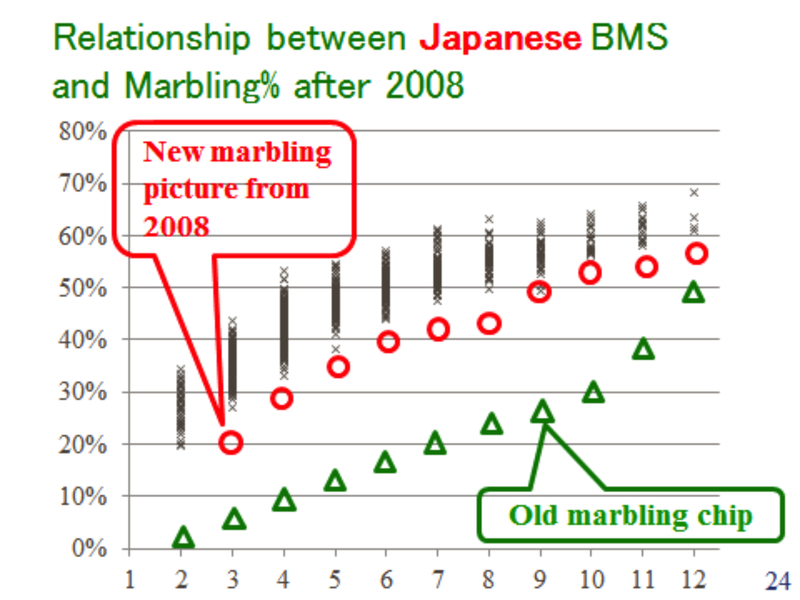 The chart below shows the difference between the original Japanese BMS grading and the 2008 standard – the 2014 standard was refined and raised even higher. Japanese carcasses are ribbed between the sixth and seventh rib throughout Japan contrasting with the US standard, which is cut between the 12th and 13th rib. The difference and distribution of marbling within each carcass is pictured on the following page. The Japanese also have a designation for the overall quality of the carcass – which includes the BMS score and yield grades. Simply put, there are grades of beef yield going from A to C and the BMS scores are noted by a designation of 1 to 5 (BMS scores of 8 to 12 are given a 5; BMS 5 through 7 are given a 4; etc). Note that the BMS grade is based on a number of different factors, including the amount of marbling; color; firmness and texture; and other factors. The most highly prized carcasses are deemed an A-5 and the lowest grade is C-1. At Lone Mountain, we focus primarily on the amount of marbling (IMF%); the fineness or coarseness of the marbling; and the size and shape of the ribeye. The Japanese BMS standard, on the other hand, takes into consideration many more factors as mentioned above. 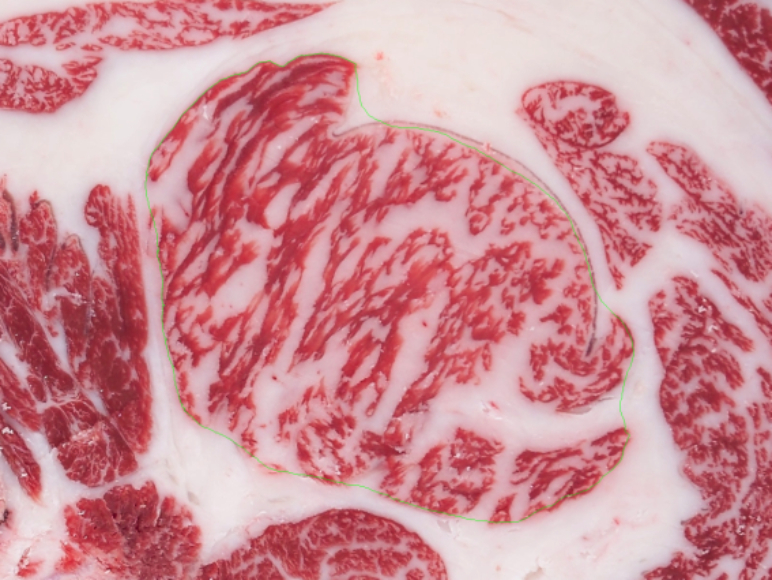 There are a number of reasons why we at Lone Mountain opt to concentrate on IMF%, fineness of marbling, and to a lesser extent, shape of the Ribeye, instead of following the BMS standard like our Japanese counterparts. Most importantly, we have found that there is a great deal of confusion, misinformation, and lack of understanding about the BMS standard in the American marketplace. From a marketing perspective, we aim to keep it as simple as possible, and the clear, objective IMF% numbers serve that purpose. Not only has the Japanese BMS scale changed dramatically over time, but the Australian beef industry has their own BMS grading system – AUSMEAT – which changed in 2008 in order to better compete with the Japanese standard. The Japanese BMS system has changed three times as noted above – but many individuals (chefs included) still relate to the original 2008 grading standard. Meanwhile, the BMS scale used in the US is, again, different from the other two countries’ scales. We maintain, therefore, that the most accurate and dependable system is the one recorded with the camera that takes each image from the same position and distance from the ribeye surface – and with identical lighting – which is then analyzed with software that produces numbers that we can be assured are objective and accurate, but more importantly, easier to understand and relate to. These numbers represent clear, actionable guidance that our clients can rely upon and understand – without the confusion of the many changing BMS standards. Lone Mountain’s genetics program is dependent on the performance data recorded, imaged and analyzed on the herd from birth to slaughter. It should provide confidence for valued clients that there exists actual, objective substance behind each breeding decision that is made, and in every facet of the Lone Mountain Cattle business model.